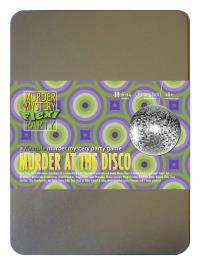 You've been invited to play the role of ROLAND SLIDE in Murder at the Disco. New York, 1977. Hot nightclub Disco 54 is hosting a birthday and only the coolest people are there. But before anyone can 'get down on it', nightclub owner Doctor Disco is found dead in the VIP lounge! Join us to find out whodunit! You don’t always wear your rollerskates, but you do always wear shiny red shorts, a white t-shirt, rainbow stripe braces and knee pads. A bright sweatband catches the sweat you make when you’re rollin’. Raised by your Uncle Bowen and Aunt Peru, your childhood wasn’t like that of other people. Working on their farm, year in, year out, you hoped for a chance to leave Boston and head for bigger, brighter lights. Searching for your father led you to New York where Doctor Disco gave you your big break - as a roller waiter. Whilst waiting to reunite with your parents, you pass the time collecting movie memorabilia and watching Star Wars and Rollerball whenever you get the chance. JON-A-THAN! JON-A-THAN! I’m Roland Slide, your roller waiter for this evening. I’m like a roller Jedi, getting down with your order - delivery with no entanglements if you catch my drift. Doctor Disco was like a dad to me, and a doctor and an employer, all wrapped into one groovalicious package. I’ve no idea which one of you dark siders wanted him dead. I’ve not had a break all night though, so there’s no way it was me - even if I knew the PIN.